If you’ve been searching for a way to decorate your home for the holidays with an homage to the classic style of days gone by, we have some beautiful options to help you complete your look. From your kitchen, to your living room, to every place in between, these fun product ideas are guaranteed to bring that vintage or retro Christmas feel to your home this season. 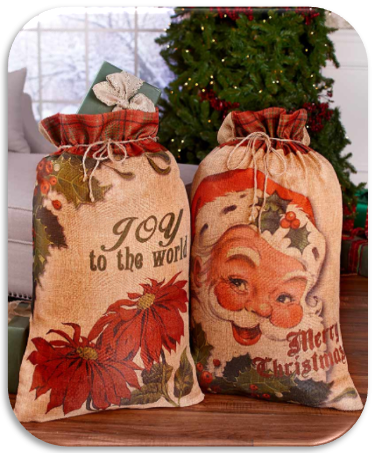 Save yourself the frustration before you wrap–have a set of gift sacks on hand! You will be relieved to have an easy option for wrapping an awkwardly-shaped gift. With their generous size and durable cloth structure, you’ll be glad you have these. – Can also be used to carry several gifts at once while traveling. – Stuff with crumpled newspaper for vintage beside-the-tree decor. – Store all your ribbons, bows and gift wrap inside during the off-season. We’ve done the work for you with this coordinating set! Buy each item in this collection for a touch of Christmas in every corner of your kitchen. 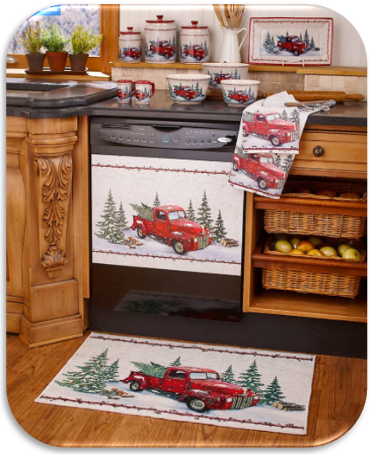 The classic red pick-up truck is on every piece, transporting you into the vintage holiday scene. – Shakers, platter and bowl can also be used in your table setting. – Canisters are perfect for your cookie baking ingredients. – Classic holiday scene ties the entire kitchen together. The beauty of this piece doesn’t stop with the beautiful winter scene–the sentiment, window-like frame and hardware add unique touches. Even if you live in a warmer climate, these wall hangings give you glimpse into winter’s beauty. 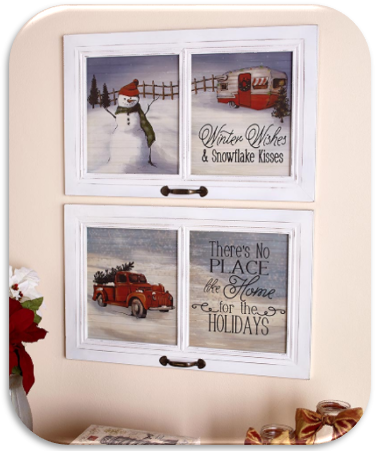 – Distressed frame gives it an inviting country feel. – Heartwarming sentiment perfect for the holiday season. – Vintage imagery coordinates with more of our vintage decor. 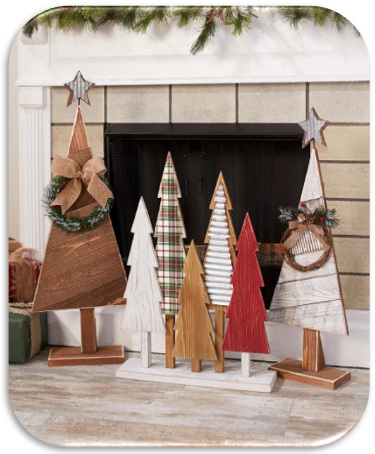 Whether choosing to display one tree or the whole forest, these wood trees are a must-have for your Christmas decor. While they’re gorgeous as accent pieces in a vintage Christmas display, the mixed trees can be creatively used as home accents throughout the year. – Check out our unique collection of Christmas ornaments. – Great tips on hosting your Tree-Trimming Party. – Learn a few more fun Christmas facts. 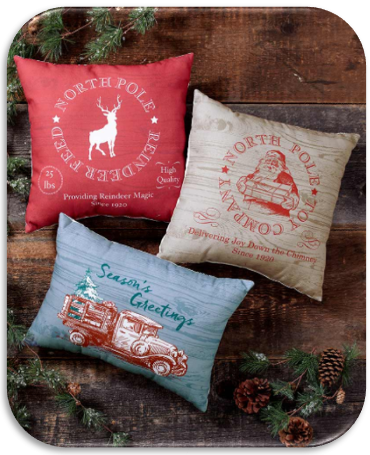 With a front design reminiscent of vintage Christmas logos, these decorative pillows add the perfect holiday touch to a sofa, side chair or bed. – Set in a side chair off-center with a small throw tossed over the chair. – One pillow front and center on a bed makes a fun holiday statement. – Get two and flank the opposite corners of your long sofa. 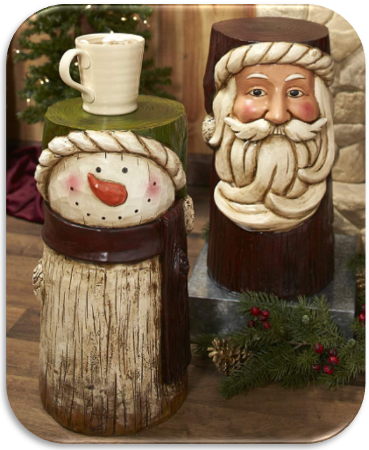 At 18” high, these pedestals offer the ultimate holiday decorative flexibility. Imagine it placed next to a chair, atop a mantle, at the base of a fireplace, or holding a small tree. It makes a strong statement wherever it’s placed and oozes old world charm. – Friendly faces of classic holiday characters with a hand-carved look. – Perfect extra side table for accommodating holiday guests. – Great statement piece to feature near your fireplace. 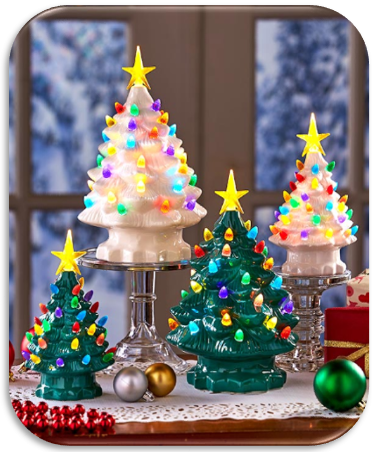 These battery-operated trees can be put on display almost anywhere in your house. With their retro styling and colorful Christmas lights, it’s bound to brighten the mood in any room and bring back Christmas memories this holiday season. – Holiday nightlight in the hall or bathroom. – Arranged with real pine cones on a tabletop display. – On a shelf in a child’s bedroom with their own decorations. A decor piece that tells a story is a great way to bring a heartwarming feel to your holiday display. These antique vehicles are on their trek home to display the beautiful lit tree they’re carrying. Wherever their destination–by your Christmas tree, on a mantle or on top of a side table–they’re ready to deliver holiday cheer. – The intricate vintage details on every inch. – Battery-operated so you can display anywhere. – Marquee-style lights illuminate your shelf or mantel. When your holiday guests come over and want to know where you picked up the new items, be sure to let them in on your secret…LTD! 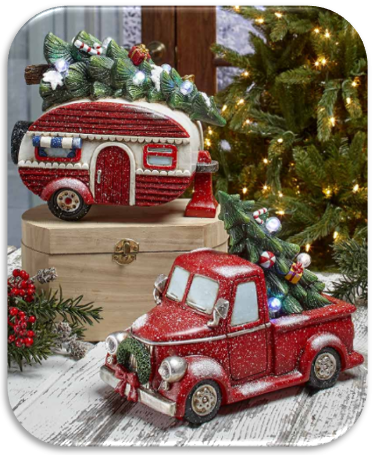 Check out our entire selection of Vintage Decor, and don’t forget to check out our latest catalog (Winter Gifts 2018) to see the wide variety of Christmas items, gifts and more!